The Signature Drink Special! This has been an exciting issue to put together. I have had the privilege of working with some of the best Mixologists in the “cocktail” industry to bring you some great signature wedding drink and champagne recipes and ideas to create your own wedding drink sensation. Featuring world-renowned media food and beverage expert, Anthony Caporale. 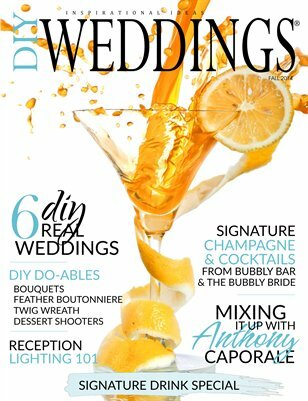 In this issue he brings you 4 informative videos sharing a wealth of information on how to make your own signature wedding drink starting on p. 11. Author, Natalie Bovis-Nelsen, of The Bubbly Bride: Your Ultimate Wedding Cocktail Guide. Starting on p. 28 you will find 17 recipes from her book. Author Maria C. Hunt shares her bubbly champagne recipes from her book, The Bubbly Bar: Champagne and Sparkling Wine Cocktails For Every Occasion on p. 140. In each issue you will get DIY crafts, real weddings and professional wedding advice.